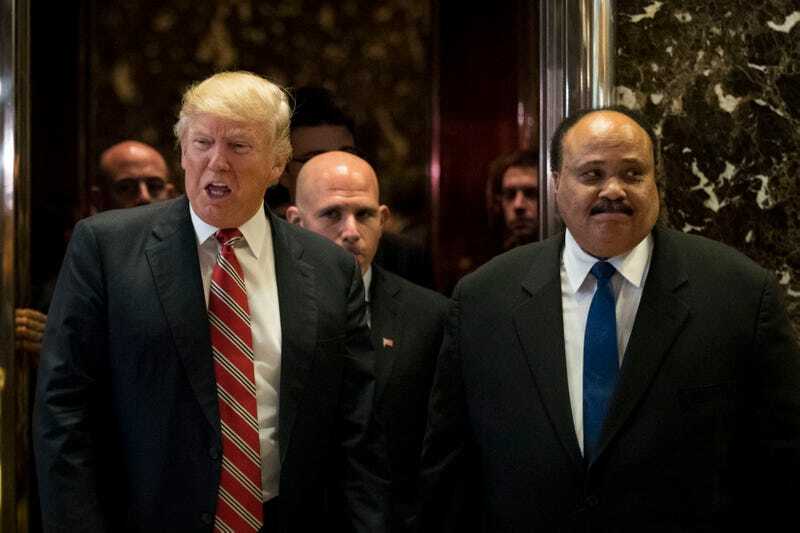 Martin Luther King III made the interesting decision to meet with Donald Trump on Martin Luther King Jr. Day, the national holiday celebrating the birth of his father. King said that Trump intends to ensure that all Americans are guaranteed the right to vote and that he plans to work with Trump to that end. When asked about Trump’s malicious attacks on Rep. John Lewis (D-Ga.), a close friend of his father’s, King said that he doesn’t believe Lewis is “all talk” as Trump claimed. “In the heat of emotion a lot of things get said on both sides ... and I think that, at some point, I am, as John Lewis and many others are, a bridge builder. The goal is to bring America together and Americans. We are a great nation, but we must become a greater nation,” King said. In Martin Luther King Jr.’s book Why We Can’t Wait, he discussed his meetings with President Lyndon B. Johnson. King didn’t shy away from naming the evils of institutional racism and discrimination, as his son has now apparently done. King made it clear that he would work with Johnson only as long as he centered the needs of black people living in poverty in the United States. Johnson, a not-so-clandestine racist, would go on to sign into law the Voting Rights Act of 1965, which in 2014 was gutted by the U.S. Supreme Court. Today the dimensions of Johnson’s leadership have spread from a region to a nation. His recent expressions, public and private, indicate that he has a comprehensive grasp of contemporary problems. He has seen that poverty and unemployment are grave and growing catastrophes, and he is aware that those caught most fiercely in the grip of this economic holocaust are Negroes. Therefore, he has set the twin goal of a battle against discrimination within the war against poverty. I have no doubt that we may continue to differ concerning the tempo and the tactical design required to combat the impending crisis. But I do not doubt that the President is approaching the solution with sincerity, realism and, thus far, with wisdom. I hope his course will be straight and true. I will do everything in my power to make it so, by outspoken agreement whenever proper, and determined opposition whenever necessary. A tale of “like father, like son,” this is not.